Players that like the thrill of Blackjack will really love the added excitement of playing up to four hands at one time as they can with RomeCasino.com’s new Multihand Blackjack. 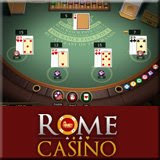 RomeCasino.com, one of the most popular US-friendly online casinos, has just introduced the new game to challenge players that like their game to move quickly. Multihand Blackjack plays just like regular Blackjack except that the player is essentially sitting at every seat at the table. This means that once one hand is played the player can quickly move on to another hand – no waiting for other players to play before the next hand is dealt. RomeCasino.com’s biggest progressive jackpot is currently at $100,636 and is available on several of their slots and video slots including the extremely popular Red White and Blue slot machine. Between this jackpot and several other smaller ones there is a total of more than $166K in progressive jackpots up for grabs. It’s no wonder RomeCasino.com is particularly popular with the most discriminating online casino players. Their games download faster than any other instant-play US online casino games and the unique multi-tabbed gaming feature enables players to play several different casino games at a time and switch between them instantly. Should a player tire of one game, they don’t have to close it down and re-load another game. They just switch from one game to another instantly by simply clicking on another open tab.